Lithuanian flag during the opening ceremony. Lithuanian basketballers have now won their first four matches in the Beijing Olympics, the only team in their group to do so. They won against the Athens Olympics champions Argentina (79:75), Iran (99:67), last year’s European champions Russia (86:79) and Croatia (86:73). 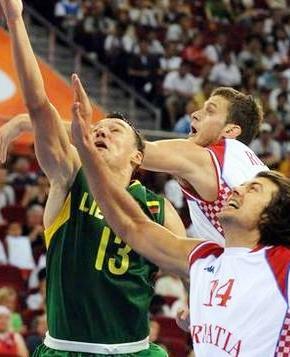 In their group Lithuania still has to play against Australia’s Boomers (Monday 18/08/08 1.15 pm EST). The first Beijing Olympics medal for Lithuania was won by the wrestler Mindaugas Mizgaitis (a bronze).